iDancehallReggae.com::Caribbean Lifestyle Media::: MAGNUM: '10 Long 10 Strong'? MAGNUM: '10 Long 10 Strong'? In very much the same way that oxygen is to living, so it is that Magnum Tonic Wine has become pivotal to the Reggae/Dancehall entertainment industry. In fact, for 10 powerful years Magnum Tonic Wine has been a vital oasis of energy in Jamaica's entertainment landscape and this year is no different. In just a few days, the brand will be unleashing their 'wow factor' across the island under the theme: '10 Long 10 Strong'.The alluring tag line speaks volumes not only about the brand's journey to glory, but also vividly illustrates the brand as the sturdy backbone they have become for the Jamaican music industry. According to Gary Dixon, Category Manager at Lascelles in charge of Magnum and a number of other brands, "The brand has been a vibrant staple in the entertainment industry since it was launched at the Cactus nightclub in August 1999. The artistes and the people, who are our consumers and patrons at our events, have grown up with the brand, and as such, we have become a powerhouse in the minds of the people, which we don't take for granted and are thankful for. We therefore had to live up to those expectations when we were planning the different activities surrounding our 10th anniversary and give the people something they would never forget." Dixon lists one of these activities as the launch of a series of '10 Long 10 Strong' free concerts around the island, namely, St. Ann, St. Elizabeth, Clarendon, St. James and Portland. The concerts will feature some of Reggae/Dancehall's premier artistes, some of whom have been mainstays in the industry for ten years and more, including: queen of the pack, Lady Saw, the always energetic Mr. Vegas and more recently, Dancehall diva Spice, ace lyricist Konshens, the captivating Chino, the king of 'nuh behaviour' KipRich and more. 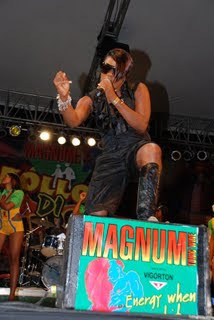 Another feature of Magnum's 10th Anniversary will be the launch of the '10 Long 10 Strong riddim'. Over the years a number of brands have released riddims, but according to Dixon, Magnum will further set itself apart by, "properly packaging and distributing the 10-track album which will feature some of the hottest artistes in the industry over the last 10 years. What will emerge from this musical melting-pot upon completion will be nothing short of show-stopping." "It's undeniable that there is something mesmerizing about the brand, so we had to also take that route when thinking of the artistes who have a similar impact on their fans. On the CD, there will be people like Spice who is known for telling it like it is, but always in a humorous way that makes you stop in your tracks and makes you want to listen; there's Bugle who has been doing great work since his emergence on the music scene and a host of other top artistes who you will have to wait on the release of the riddim to see and hear who they are; but what we can guarantee is that it's going to be spectacular," said Dixon. In addition to the already great package, the sales generated from the CDs will be in aid of a number of well-deserved cross-island initiatives. "Magnum is coming from a time when in 1999 selling 30 cases of the product was seen as a grand achievement for us. Where we stand today as a leader in the market could not have been done without our consumers; therefore, in every project that we launch, particularly those in the '10 Long 10 Strong' series, giving back to the people is always foremost in our thoughts," said Dixon.